Boquete is situated in a rural area at an elevation of 3000 ft in the beautiful highlands of Chiriqui province in the far west of Panama, close to the Costa Rican border, and about a seven hours drive from Panama City. Located between two oceans a drive of 1 hour will take you to endless Pacific beaches while within 2.5 hours you'll arrive at the beautiful caribbean islands of Bocas del Toro. Towering above Boquete is the dormant Volcano Baru, Panama's highest mountain (11,398 ft or 3474 m). Don't forget to check out some of the best coffees grown in the world! Check the visitors' info section in the directions sub-menu for more information. Panama's domestic airline Air Panama provides 30 minutes flights three times a day between Albrook airport in Panama City and Enrique Malek airport of David, the provincial capital of Chiriqui, and Panama's second largest city with about 200,000 inhabitants. International travelers would usually have to plan for an overnight stay in Panama City before continuing to David. From David it just takes a 30 minutes ride on a new highway to get to Boquete. Rent-a-Car companies Hertz, Avis, Budget, Thrifty, Alamo are available at David Enrique Malek airport. There also are numerous buses running from the bus terminal in David. A taxi ride from to airport to Boquete is about $40. 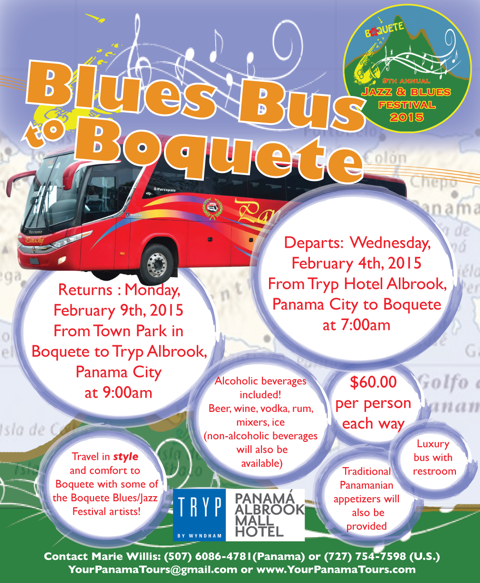 NEW: For the first time we will have a specially chartered luxury Blues Bus running from the Albrook Mall Tryp hotel in Panama City directly to Boquete on Wednesday, Feb 4, 2015, and back on Monday, Feb 9, 2015. Take advantage of the greatly discounted stays at the Tryp (check details on our lodging page), and ﻿travel to Boquete in style, with hot music, cool drinks and appetizers included! ﻿ Check the poster below for more details. Call Marie Willis at 6086-4781 or +1-727-754-7598 (US) for reservations. Copa Airlines is the private national airline of Panama offering a vast network of connections to/from South, Central and North America in cooperation with United Airlines. American Airlines as well as Delta Airlines and United Airlines offer numerous connections from/to the US and Canada. At the present time ﻿KLM, Air France and Iberia offer the only non-stop flights to Panama City from Amsterdam/Netherlands and Madrid/Spain. Lufthansa has announced to start non-stop flights from Frankfurt/Germany in January 2015. Other airlines provide lots of flights from Europe via the US and/or South America, connecting to Panama City. Travelers on long distance flights from Europe, the US, Canada or South America have direct connecting flights from the international airport of Tocumen on Air Panama's new jet service with a flight time to David of only 25 minutes. NEW: Starting Jan 15, 2015 Copa airlines will offer two daily flights between Tocumen and David for international passengers. This will avoid the time-consuming transfer from the international airport Tocumen to the domestic airport of Albrook, and in many cases also overnight stays in Panama City. And you can check your baggage right through to David! Another way to get to Boquete if you have more time availabel is to fly to San Jose/Costa Rica (flights from the US to San Jose are considerably cheaper than to Panama City), then (eventually after spending a night in San Jose) take a bus to the border ($ 12 for a 6-7 hours ride with potty and f&b stops). You'd have to walk across the border after getting your tourist visa and then take a bus to David, the provincial capital of Chiriqui (a 1hr. ride). From the bus terminal in David either take a local bus or a cab to Boquete (30mins). The long-distance buses are comfortable, and you'd see something of Costa Rica on the way. One click works magic: If you like our work please show us some love and click the 'like' button. Thanks a lot! © Boquete Jazz & Blues Festival Foundation. All rights reserved. The Foundation is not responsible for contents of external links.